Bonjour, bonjour! Today I'd like to introduce you to my new favourite shopping companion, Fashiola - if you haven't heard of them yet then get. on. it. The reason I love ASOS so much is because you can type something like, 'black lace up flats' into their search bar and have a few different options pop up; imagine that but on a MUCH bigger scale. And by much bigger I mean a whopping 94 shops and 1781 brands. Oh mumma. So, basically, rather than having to do a round of all your favourite websites when you're looking for something in particular, you've got them all gathered together in one big, easy-to-search site. Exciting, ya? It's become my new best friend, every time I see something I like on someone but don't know where to find it - or when I want to create one of Alexa Chung's looks, ahem - I head straight over to that glorious little search bar. You can narrow your search right down by new arrivals/sale, colour, price range, delivery dates, size, you name it, so that you're only left with the options that suit you. If you want you can save your favourite products to your account for the future (handy if you realise you've already blown that week's food allowance on shoes) rather than buying them there and then. I hope you like the site as much as I do, and I'd like to absolve myself of all blame in regards to the large shopping sprees it may lead to in advance. Basically I just took a browse through the site & I think for the 1st time I know what love feels like! haha not really I'm sure my guy would kill me if that were true. I do however plan on throwing away some savings on this site & don't worry I don't blame you. I really love that skirt! Serious booty envy! That skirt looks rawrsome on you! LOVING this look Amy! The skirt is gorgeous, loving it with the novelty tee too! Such a fun look Amy! The playful top and clashing prints all work together with that colour scheme - super cool girl! Hahah title is amazing! All I hear is "Scuba Steve!! DAMN YOU!" You look so good in this skirt! I want the shirt and heels! This website sounds so good but so dangerous! You look amazing in this outfit by the way - serious figure envy! I love your ring!! Super fun look!! I am in love with this outfit. The skirt and top look perfect together. The whole look is casual but also dressy. Gorgeous! This site is amazing too! Such a gorgeous alternative to typical stripes! Amazing style! Love the skirt! The sandals are so cute! you have a perfect body! Looking great in that pencil skirt! 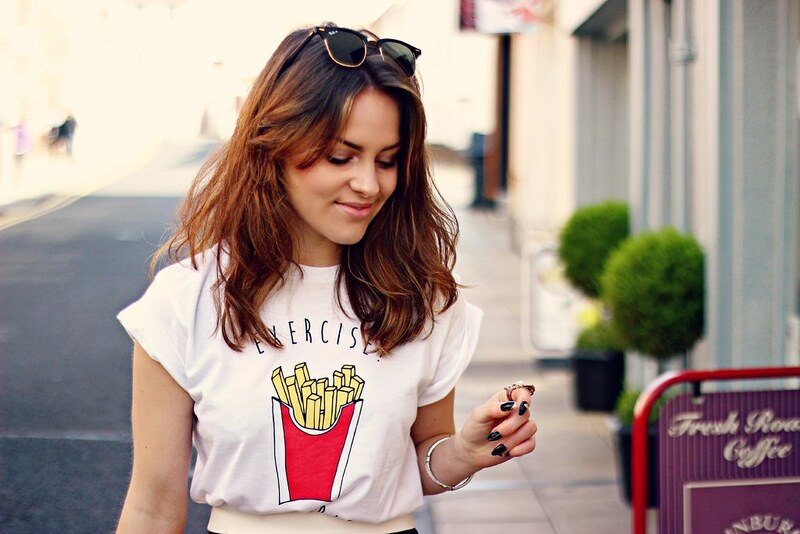 Love the sandals and the tee is so cute! OOOO I love those shoes! I think me and you are shoes twins haha, we always seem to love the same shoes! that skirt is amazing on you! you in that skirt amy, is basically everything!